Yep, in Queensland being a financial member of a club like SSAA or shooters union is ok for your genuine reason. This permits you for both target and hunting on condition you stay as a paying member of a club. Thank you. In this case it must just be a simply administration error - I'll call them today. Was very worried last night. I brought this up with my club mate, he comfirmed it, and we both agreed it's radically stoopid. Collecting = Collectors licence / Collectors membership. We need structure for solidarity and accountability to protect ourselves and everyone else. A former firearms dealer has been charged with more than 100 offences over his alleged role in a criminal network. The 40-year-old man was arrested at Parramatta Police Station at 3pm on Wednesday and charged with 101 offences, including participating in a criminal group, hindering the discovery of evidence of a serious indictable offence, and various firearms offences. 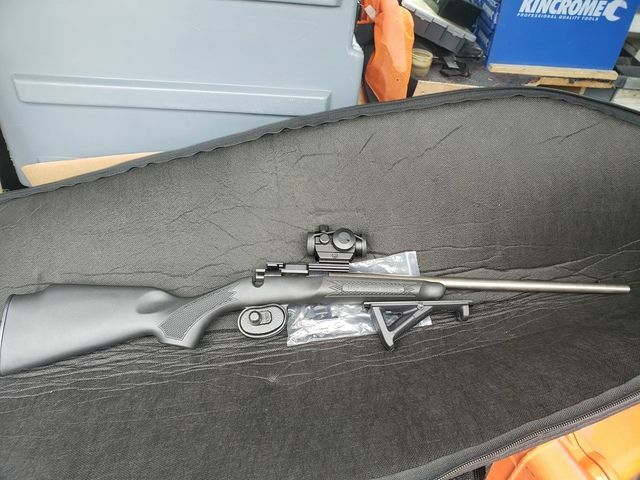 Police will allege the Seaham man knowingly repaired and altered ballistic identification on a firearm which was used in serious indictable offences by the criminal network. Good to see another Law Abiding Firearms Owner doing the right thing. Had a few mates of mine unknowingly caught up in it. They had to go down to the Police Station and retrieve their registered firearms. I don’t see a problem with the way Queensland do it allowing general SSAA membership as genuine reason. They have ranges where you can attend for a casual shoot whenever or a club comp if you want to be there at a specific time/day each month. Nothing wrong with either, i know a lot who just go for a casual bit of target shooting/plinking every once in a while. Don’t need to enter comps to enjoy the sport. Huh. "National Firearms Agreement" but the different authorities often couldn't be more different. In Vic, just being with the SSAA is enough. That covers sport target and hunting pests on private and crown land, game permit to access crown land for game. I'd ask around at F-Class. You'll surely have other members that have had the issues. A polite call to licensing would also be an excellent idea when armed with good info. Firstly - daily mail, really? If the article is accurate, which I doubt given the source, they'll get what they deserve the greedy stupid gits. Now they get to live the rest of their lives with a criminal record, unable to legally touch a firearm ever again in any state nor hold any job, professional membership or permit that requires a criminal check. Nice life eh. Just got back from doing a farm clean up. Everything is in a pretty dire state. Plenty of roos already starved to death, random dead emaciated joyes and the rest are not in good shape. The few pigs about looked pretty thin as well, not 1 sucker or weaner to be seen. Fields are either fallow or have feed crops planted, like oats. Most livestock has been sold off, what does remain is breeding stock on feed. Did find 1 oddity though, shot this little bugger. Never seen anything like it, either have the several farmers i showed. He was in surprisingly good condition and had full guts. WA is having a blinder though, dams are full and ground soak is decent, need another couple years to put us into a safe ground water state though, more sub-divisions going up by the month. NE NSW, Northwest Slopes and Plains. Farms i was on are currently categorised the highest level of drought "Intense Drought". Been a few years since they've had any substantial rain. Farms i was on aren't doing too badly financially wise, due to Santos gas wells. The money they bring in is a massive help in severe droughts. I think the rabbits teeth were a result from an under-bight or something similar, still got me buggered as to how it was alive for so long, little own in good condition. The specifications are incredible, four 6 mm barrels cut side by side within one steel block. New ammunition blocks fired by electromagnetic actuators that could theoretically give the weapon a firing rate of 250 rounds per second. anyone seen a ffp 1x power scope in mil? spent several hours on google, everything seems BDC which is trash. Depends how much cash you want to spend and exactly what you want. Plenty of options out there, most good manufacturers make one, generally in their high end line-up. I'm think there may even be some red dots out there with mil reticles. I forgot to mention that part, all those are $1k+ AUD. Looking for something less because it's most likely going on a 16" t1x. The Athlon is $300USD but with trade restrictions getting it here will be a hassle. I think a aussie retailer has it listed for $585. Not many SFP mil/non bdc options either. I got the biggest confused look on my face trying to figure out your reasoning to not want SFP or BDC or MIL or cheapest price...but yeah i'll "hold off"
www.nvt.com.au go there and find anything in OZ, the prices are pumped, find the scope and check other retailers like Cleavers or Magnum and should be cheaper. i have an Burris XTR in Mil on a 308 and want to convert my 22lr. I can't justify spending $1k on a scope that's going to shoot 100m. As carry on luggage, then yeah it's a good idea...but it'll be a one off thing, BURRIS glass is nice, i'd go Leupold VX whatever, Night Force pricing is same AUS. and Leupy warranty is lifetime. Before sending my mate to Guantanamo to meet big bob, it looks like anything firearms related may require a export permit. From what I read, this can apply to Scopes and slings depending on the customs officer. Shouldn't have a problem bringing a scope in luggage. But when in doubt, B709A. Leupold is a great choice if you think your cousin is attractive. I do own one of their scopes though. Recently went for a walk up some fukn massive hills and found a good mob of goats. 270gr Woodleighs make a real big mess of goats just FYI.